Baird, D., 1997, Goals in Jordanian Neolithic Research. In ThePrehistory ofJordan II. Perspec-tivesfrom 1997, edited by H. G. K. Gebel, Z. Kafafi, and G. O. Rollefson, pp. 371-381. Studies in Early Near Eastern Production, Subsistence, and Environment 4. Ex Oriente, Berlin. Banning, E. B., and Byrd, B. F., 1987, Houses and Changing Residential Units: Domestic Architecture at PPNB 'Ain Ghazal. Proceedings of the Prehistoric Society 53:309-325. Bar-Yosef, O., and Belfer-Cohen, A,, 1989, The Levantine "PPNB" Interaction Sphere. In People and Culture in Change: Proceedings of the Second Symposium of Upper Paleolithic, Mesolithic, and Neolithic Populations of Europe and the Mediterranean Basin, edited by I. Hershkovitz, pp, 59-72. British Archaeology Review, International Series 508. BAR, Oxford. Bar-Yosef, O., and Meadows, R., 1995, The Origins of Agriculture in the Near East. In Last Huntem-FirstFarmers: New Perspectives on the Prehistoric Transition to Agriculture, edited by T. D. Price and A. G. Gebauer, pp. 39-94. School for American Research, Santa Fe, New Mexico. Berreman, G. D., 1981, Social Inequality: A Cross-Cultural Analysis. In Social Inequality: Comparative andDevelopmentalApproaches, edited by G. D. Berreman, pp. 3-40. Academic Press, New York. Bienert, H. D., 1991, Skull Cult in the Prehistoric Near East. Journal ofPrehistoric Religion 5:9-23. Blanton, R. E., 1995, The Cultural Foundations of Inequality in Households. In Foundations ofSocialInequality, edited by T. D. Price and G. M. Feinman, pp. 105-127.Plenum, New York. Byrd, B. F., 1994, Public and Private, Domestic and Corporate: The Emergence of the Southwest Asian Village. American Antiquity 59(4):639-666. Byrd, B. F., and Banning E. B., 1988, Southern Levantine Pier Houses: Intersite Architectural Patterning during the Pre-Pottery Neolithic B. Paleorient 14:65-72. Cauvin, J,, 1994,Naissance des divinités, Naissance de l'agriculture. CNRS, Paris. Crumley, C., 1987, A Dialectical Critique of Hierarchy. In Power Relations and State Formation, edited by T. Patterson and C. W. Gailey, pp, 155-169. American Anthropological Association, Washington, D.C.
Feinman, G. M., 1995, The Emergence of Inequality: A Focus on Strategies and Process. In Foundations of Social Inequality, edited by T. D. Price and G. M. Feinman, pp. 255-279. Plenum, New York. Flanagan, J. C., 1989, Hierarchy in Simple "Egalitarian"Societies. Annual Review ofAnthro-pology 18:245-266. Flannery, K. V., 1972, The Origins of the Villages as a Settlement Type in Mesoamerica and the Near East: A Comparative Study. In Man, Settlement and Urbanism, edited by P. J. Ucko, R. Tringham, and G. W. Dimbleby, pp. 23-53.Duckworth, London. Garfinkel, Y., 1994, Ritual Burial of Cultic Objects: The Earliest Evidence. CambridgeArchae-ology Journal 4(2):159-188. Gebel, H. G. K., and Bienert, H. D., 1997, Ba'ja Hidden in the Petra Mountains. Preliminary Report on the 1997 Excavation. In The Prehistory ofJordan II. Perspectivesfrom 1997, edited by H. G. K. Gebel, Z. Kafafi, and G. O. Rollefson, pp, 221-262.Studies in Early Near Eastern Production, Subsistence, and Environment 4. Ex Oriente, Berlin. Hayden, B., 1995a, Pathways to Power: Principles for Creating Socioeconomic Inequalities. In Foundations ofSocialInequality, edited by T. Douglas Price and G. M. Feinman, pp. 15-86, Plenum, New York. Hayden, B., 1995b, The Origins of Agriculture in the Near East. In Last Hunters-First Farmers: New Perspectives on the Prehistoric Transition toAgriculture, edited by T. D. Price and A. G. Gebauer, pp. 273-299.School for American Research, Santa Fe, New Mexico. Hodder, I., 1987, Contextual Archaeology: An Interpretation of Çatal Huyuk and a Discussion of the Origins of Agriculture. Bulletin of the Institute of Archaeology 24:43-56. Hodder, I., 1990, The Domestication ofEurope: Structure and Contingency in Neolithic Societies. Basil Blackwell, Oxford. Kafafi, Z., and Rollefson, G., 1995, The 1994 excavations at 'Ayn Ghazal: Preliminary Report Annual of the Department of Antiquities ofJordan 39:13-29. Kan, S., 1989, SymbolicImmortality: The TlingitPotlatch oftheNineteenth Century. Smithsonian Institution Press, Washington, D.C.
Kelly, R. C., 1993, Constructing Inequality: The Fabrication of a Hierarchy of Virtue among the Etoro, Unversity of Michigan Press, Ann Arbor, Michigan. Kohler-Rollefson, i., and Rollefson, G., 1990, The Impact of Neolithic Man on the Environment: The Case of 'Ain Ghazal, Jordan. In Man's Role in Shaping oftheEastern Mediterranean Landscape, edited by S. Bottema, G. Entjes-Nieborg, and W. Van Zeist, pp, 3-14. Rotterdam, A Balkema. Kuijt, I., 1995, New Perspectives on Old Territories:Ritual Practices and the Emergence of Social Complexity in the Levantine Neolithic. Ph.D. dissertation, Harvard University. University Microfilms, Ann Arbor, Michigan. Levi-Strauss, C., 1983, The WayoftheMask. Translated by S. Modelski. Jonathan Cape, London. McKinnon, S. 1991, From a ShatteredSun: Hierarchy, Gender, andAlliance in the Tanimbar Islands, University of Wisconsin Press, Madison, Wisconsin. Mellaart, J., 1967. Çatal Hoyuk, a Neolithic Town in Anatolia. McGraw-Hill, New York. Moore, A,, 1985, The Development in Neolithic Societies in the Near East. In Advances in World Archaeology, edited by F. Wendorf and A. E. Close, pp, 1-69. Academic Press, New York. Nissen, H. J., Muheisen, M., and Gebel, H. G. K., 1987, Report on the First Two Seasons of Excavation at Basta. Annual ofthe Department ofAntiquities ofJordan 31:79-119. Özdögan M., and Özdögan A., 1989, Qayönü. Paleorient 15:65-74. Paynter, R., 1989, The Archaeology of Equality and Inequality. Annual Review of Anthropology 18:369-399. Plog, S., 1995, Equality and Hierarchy: Holistic Approaches to Understanding Social Dynamics in the Pueblo Southwest. In Foundations ofSocial Inequality, edited by T. D. Price and g. M. Feinman, pp. 189-206. Plenum, New York. Quintero, L., A. and Wilke, P. J., 1995, Evolution and Economic Significance of Naviform Core-and-Blade Technology in the Southern Levant. Paleorient 21(1):17-33. Rayner, S., 1988, The Rules That Keep Us Equal: Complexity and Costs of Egalitarian Organization. In Rules, Decisions, and Inequality in Egalitarian Societies, edited by J. G. Flannagan and S. Rayner, pp. 20-42. Gower, London. Renfrew, C., 1974, Beyond a Subsistence Economy, the Evolution of Social Organization in Prehistoric Europe. In Reconstructing Complex Societies, edited by C. B. Moore, pp. 6995. Bulletin of the American School of Oriental Research. Rollefson, G. O., 1986, Neolithic 'Ain Ghazal (Jordan): Ritual and Ceremony II. Paleorient 12:45-52. Rollefson, G. O., 1987, Local andRegional Relations in the Levantine PPN Period: 'Ain Ghazal as a Regional Center. In Studies in the Histoy and Archaeology ofJordan, edited by A. Hadidi, pp. 2-32. Amman, Department ofAntiquities ofJordan. Rollefson, G. O., 1996, The Neolithic Devolution: Ecological Impact and Cultural Compensation at 'Ain Ghazal, Jordan. In Retrieving the Past: Essays on Archaeological Research and Methodology inHonorofGus W. VanBeek. editedbyJ. S. Seger, pp. 219-229.Eisenbrauns: Winona Lake, Indiana. Rollefson, G. O., 1997, Changes in Architecture and Social Organization at 'Ain Ghazal. In The Prehistory ofJordan II, Perspectivesfrom 1997, edited by H. G. K. Gebel, Z. Kafafi, and G. O. Rollefson, pp. 287-307.Studies in Early Near Eastern Production, Subsistence, and Environment 4. Ex Oriente, Berlin. Rollefson, G. O., 1998, The Aceramic Neolithic. In The Prehistoric Archaeology ofJordan edited by D. O. Henry, pp. 102-126.Archaeopress, Oxford. Rollefson, G., and Köhler-Rollefson, I., 1989, The Collapse of Early Neolithic Settlements in the Southern Levant. In People and Culture Change: Proceedings of the Second Symposium on UpperPaleolithic, Mesolithic and Neolithic Populations of Europe and the Mediterranean Basin, edited by I. Hershkovitz, pp. 59-72. British Archaeological Reports, International Series 508. BAR, Oxford. 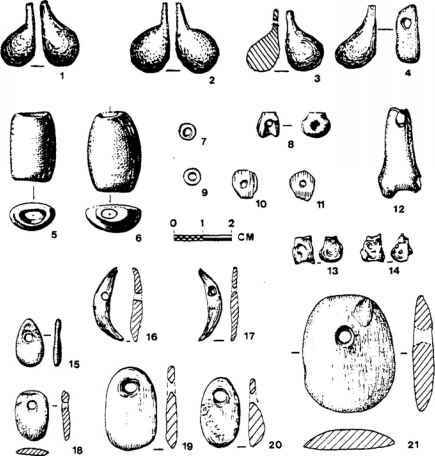 Rollefson, G. O., Simmons, A. H., and Kafafi Z., 1992, Neolithic Cultures at 'Ain Ghazal, Jordan.Journal ofField Archaeology 19:443-470. Schiller, A,, 1997, Small Sacrifices: Religious Charge and CulturalIdentity among theNgaju of Indonesia, Oxford University Press, New York. Schmidt, K., 1997, "News from the Hilly Flanks": Zum Forschungsstand des obermesopotamischen Frühneolithikums. Archäologisches Nachrichtenblatt 2(1):70-79. Voigt, M. M., 1983, Hajji Firuz Tepe,Iran: The Neolithic Settlement. The University Museum, University of Pennsylvania, Philadelphia, Pennsylvania.